Letter from the Editor | Food E.
If you are getting married in the near future (and I know some of you are), and you have invited me (and I know some of you have), then I implore you: serve this at your wedding. Pretty, pretty please. I promise if you do, I will bring you a way nicer gift than I had originally planned. 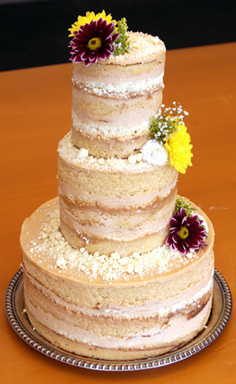 In case you were unaware, as I was until today, Momofuku Milk Bar (one of my favorite places on planet Earth), makes wedding cakes. Oh yes, they do. And friends, loves, nearest-and-dearest-to-my-hearts, if you’re not down for a whole wedding cake, you can order slices of Crack Pie as wedding favors. Nothing says “thanks for celebrating my union” like a slice of Crack Pie. And if you can’t manage to serve this tower of perfection at your own wedding, maybe you could set me up with a single friend who will soon propose so I can thus serve it at my own. Deal?